Come one, come all, It’s Time TO PLAY! 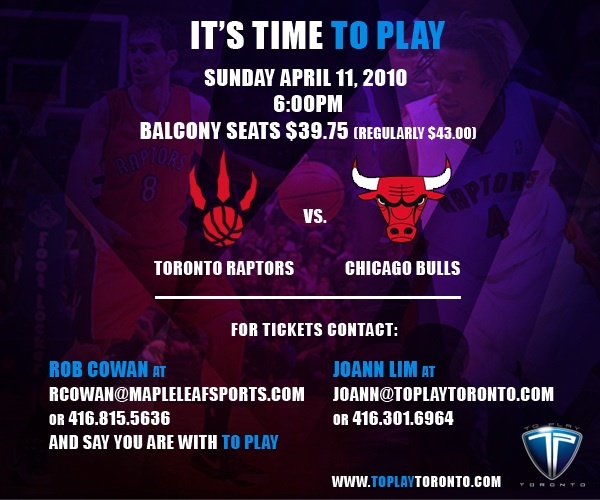 Join the playmakers and our favourite people as we take in the action when the Toronto Raptors take on the Chicago Bulls in what could be one of the most exciting games of the season. The Raps currently sit in the 8th and final spot of the playoffs while the Bulls are ONE game back. In what could be the “turning point” of our season, join us for the 2nd last home game of the season. COME TO PLAY!